The Danish-led Combined Task Force 151 (CTF 151, counter piracy) is entering its third week at sea onboard U.S. guided-missile destroyer, USS HALSEY (DDG 97) operating off the Horn of Africa, Jan. 27. CTF 151 is responsible for counter piracy operations in an area the size of western Europe, and supplies are essential to sustaining the mission. 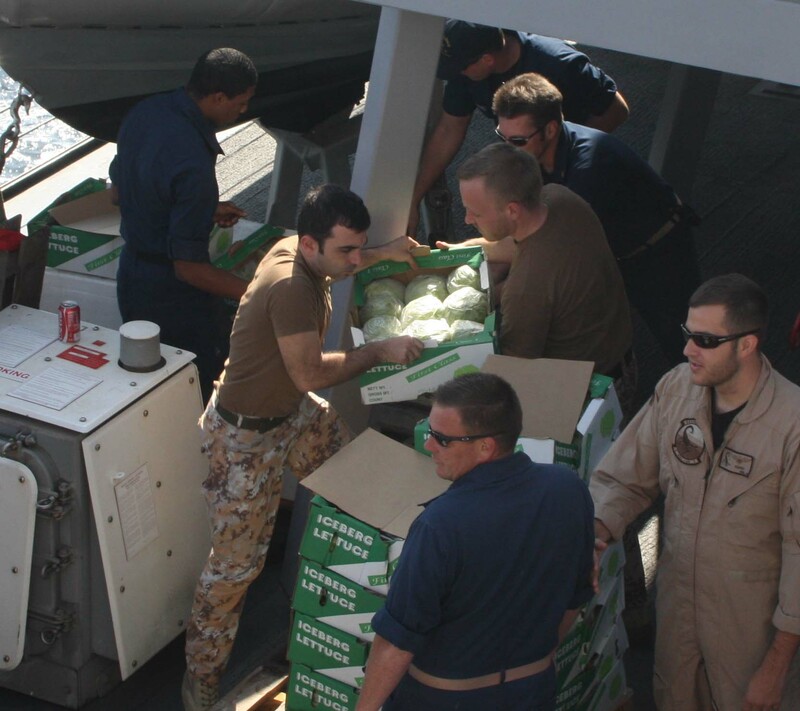 Whilst most naval units can be resupplied at sea for items, such as fuel, many have to proceed to port to restock food and other necessary items. In a dynamic mission, such as counter piracy, a few days away from the area of operations can have a huge impact to the overall effectiveness of the mission. In order to remain on task, HALSEY conducted a replenishment at sea with USNS PECOS, a 206 meter supply ship that can carry over 42,000 tonnes of fuel. The PECOS’s capability is not just limited to fuel; she has two dry cargo rigs to transfer stores via a pulley system. More than 60 pallets of food were transferred, while simultaneously removing waste from HALSEY so that it can be delivered ashore to be correctly disposed of. HALSEY recently assumed the role of flagship for Commodore Aage Buur Jensen, Royal Danish Navy and his multi-national CTF 151 command staff. CTF 151 transferred command from the Pakistan Navy who were stationed aboard the USS KIDD (DDG 100), Jan. 13. CTF 151 is one of three Task Forces assigned to Combined Maritime Forces. Established in February 2002, the Task Force’s key mission is to conduct counter-piracy operations in the Red Sea, Gulf of Aden, Somali Basin, Arabian Sea and Indian Ocean. It protects and defends the legitimate use of the ocean by fishermen and merchants and stands ready to assist any mariner in distress.